I like to change the bedding seasonally. I usually have a set for spring/summer and a set for fall/winter, plus extra sheets. The set I had for spring/summer was looking a little worn, and it was kind of "girly" so I decided to replace it this year. Since I'm living with Rob now, I wanted to get a set we'd both like. 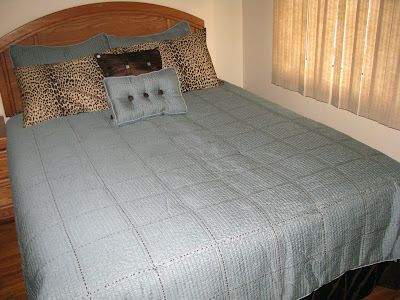 We found a great high quality set a couple months ago at 50% off that came complete with shams, bed skirt, sheets, comforter and 2 decorative pillows. We finally got around to putting it on the bed this week. We both like the color combination of the brown and blue, and the leopard print sheets that came with it were something we both really liked too. Awwww! Your sweetie cat looks like my "baby" Roxanne (19 years young! and acting like a kitten). Meadow is one lucky girl. Okay- my mother used to do this but I'm soooo not that organized. I wish I was but I'm not. I don't even change my clothes from one season to another. As I rattle on here I sense a post could come from this, LOL. I love your cat. I have an orange one. I have always wanted one that color. We have different bedding summer and winter. We all enjoy it very much... both at night and the occasional afternoon naps. I see all your feed back on retro bedding and it appears like some of you are looking for more designs. 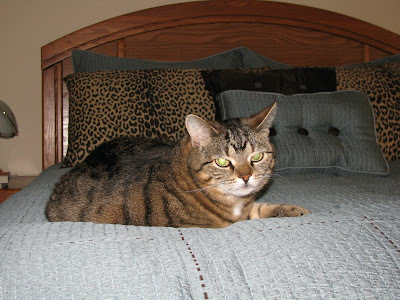 How sweet pictures of your new bedding set and cat... I have similar kind of bedding set! !